Most vehicles contain high intensity discharge (HID) lamps. They used in the headlamps of the vehicle. Some drivers have great results in using the HID headlights, where as others find disadvantages to using them. The advantages of having HID lamps are plentiful. Xenon headlights offer a larger spectrum of visibility while driving. This specific style of headlights was first developed in 1991 and has since gained in popularity due to the benefits. During that time the headlights were more expensive than individuals were willing to pay for lamps. However, in the recent days the cost has plummeted making them far more affordable. One of the main benefits of having Xenon headlights is the fact they offer a longer lasting life than typical lamps. They last three times longer that the halogen bulbs. This will save the driver money. Another wonderful advantage is they offer lower energy usage. The Xenon headlights use 25-30 percent less energy than halogen bulbs. It is much easier on the electrical system and the battery, which will also save money for the driver. 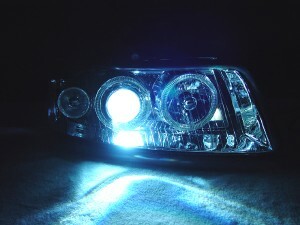 Of course the fact Xenon headlights are extremely more attractive than typical headlights it one of the benefits. The light given off by these types of headlights are cleaner and provide a classy look to any luxury vehicle. It is considered to be cost efficient and an aesthetic upgrade for your vehicle. Xenon headlights are functional and elegant. With every wonderful product, there are always drawbacks. One of the disadvantages to the HID headlights is the brightness of the lights in the rear view mirrors. This causes a problem for drivers in front of your vehicle. It is so widely known that USA Today did an investigation and report on the headlights. They found although they prove to be troublesome, using halogen bright lights are debilitating, where as the HID lamps do not offer impairment for the drivers in front of the beams. They are still overall better than traditional lamps. There have been reports of drivers having issues while driving in foggy weather conditions. The blue light of the HID headlights prove to scatter more with water droplets than typical headlights. In conclusion, the HID headlights are more cost effective, provide a more natural light while driving, extends the life of the headlights, battery, and electrical system; this offers the solution to the problem on confusion to purchasing Xenon headlights.